In just a few hundred years, a modest peninsula off the northwest corner of Asia has seen the rise and fall of several empires; served as the crucible for scientific dynamism, cultural innovation, and economic revolution; and witnessed cataclysms and bloodshed that have almost destroyed it several times over. This is Europe: a continent whose identity emerged not so much by virtue of geographic or ethnic continuity, but by a long and storied struggle for power. 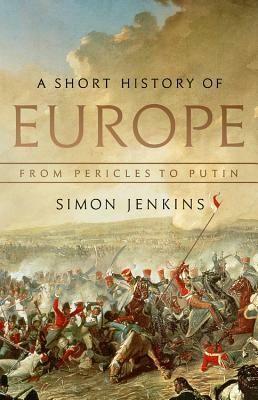 Studded with infamous figures--from Caesar to Charlemagne and Machiavelli to Marx--Simon Jenkins's history of Europe travels briskly from the Roman Empire, the Dark Ages, and the Reformation through the French Revolution, the World Wars, and the fall of the USSR. What emerges in this thrilling and expansive telling is a continent as defined by its continually clashing cultural identities and violent crises as it is by its tireless drive for a society based on the consent of the governed--which holds true right up to the present day. Sir Simon David Jenkins is a British author and newspaper columnist and editor. He served as editor of the Evening Standard from 1976 to 1978 and of The Times from 1990 to 1992. He currently writes columns for both The Guardian and Evening Standard. He is the author of many books, among them A Short History of England (PublicAffairs, 2011). He lives in London.